This is a sponsored post written by me on behalf of Dollar General for IZEA Worldwide. All opinions are 100% mine. 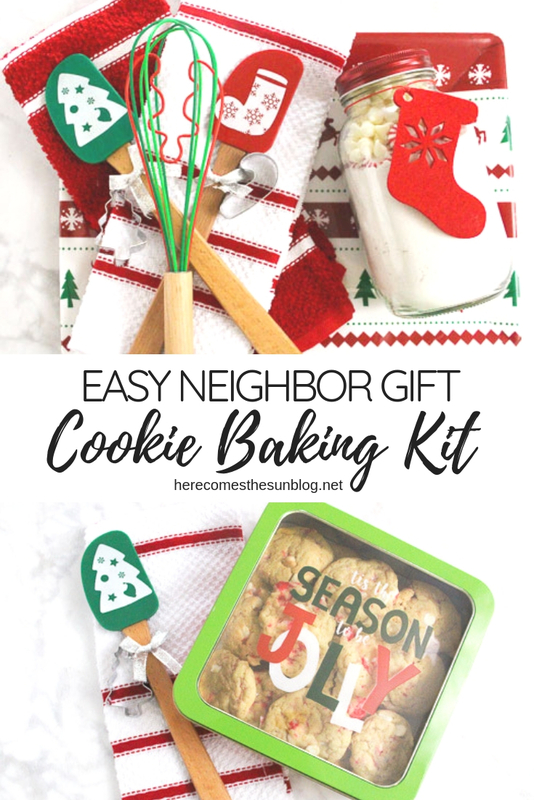 This cookie baking kit gift is easy to make and your neighbors will love it! The other day, my neighbor delivered some delicious pumpkin muffins to us which got me thinking that we should make some neighbor gifts this year. Last Christmas was our first in our new neighborhood but since we were out of town for the holidays, we didn’t get a chance to deliver any neighbor gifts. But this year, I got on the ball and decided to make them early. First up, this cookie baking kit. My local Dollar General had everything that I needed to put together an easy and affordable cookie baking kit gift. Dollar General has a great selection of cute holiday decor so I headed over to the section with all the baking/kitchen/holiday containers. I found so many fun items to include. Include anything and everything that you can find for cookie baking. Dish towels for unexpected (or expected?) 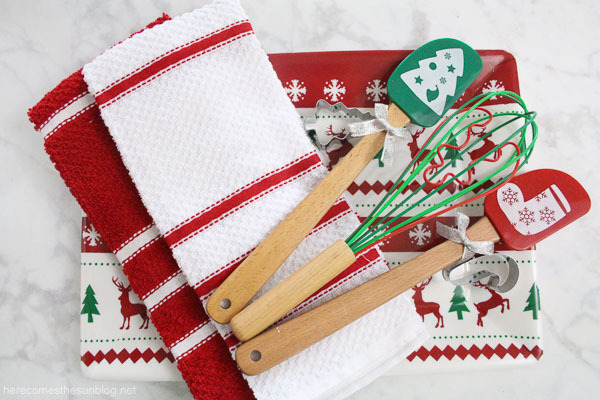 messes, fun and festive baking utensils, cookie cutters and a tray to serve up the warm cookies. 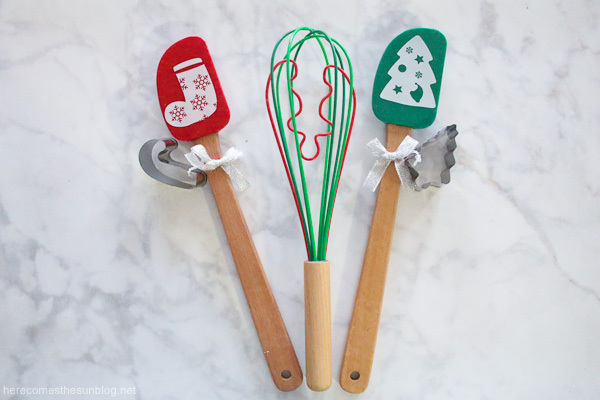 I really love these spatulas and the whisk. 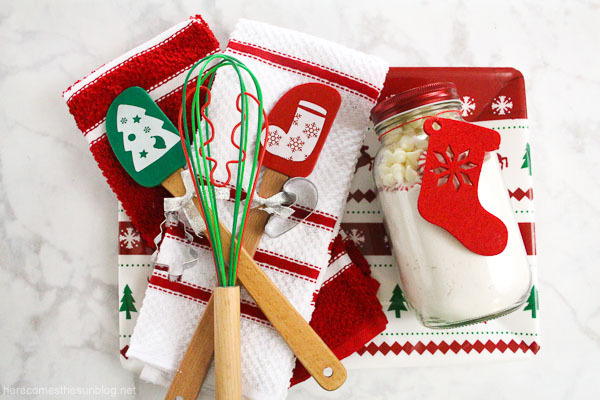 Isn’t the little gingerbread man on the whisk so cute? 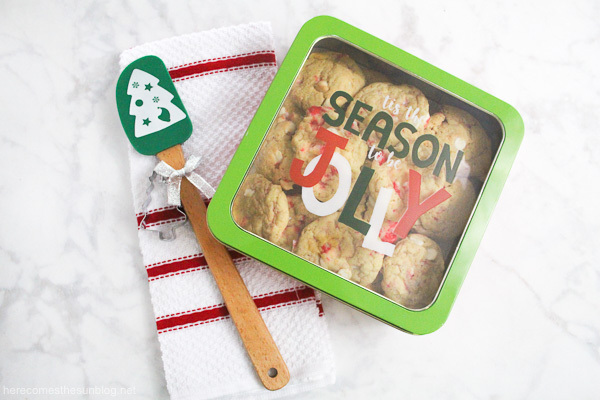 Putting together this cookie baking kit gift takes only a few minutes. 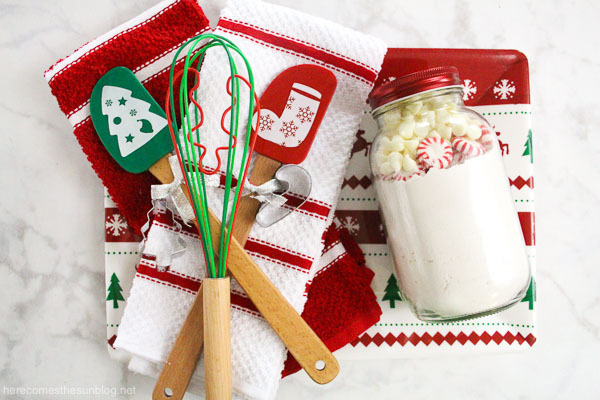 I used the festive tray as a base and added the cookie baking supplies and filled a mason jar with the dry ingredients for my white chocolate peppermint pudding cookies recipe. Be sure to include a recipe card for your cookies. I also made a batch of the cookies so my neighbor can try them out first. How adorable is this cookie container? I love how the top is clear so you can see the yummy cookies inside. The container makes the perfect gift box but Dollar General also has a big selection of gift wraps to choose from as well. This gift is affordable and cost less than $20. If you’re looking for more affordable holiday gift ideas, be sure to Explore More DG Home Goods.